Curious about what the classes are that I’ve offered in the past? Here’s a page to see what I’ve covered. This is a great place to get ideas for clinics or presentations you can have me bring to a live event for your club or organization. You may have missed your opportunity to sit in on these classes the first time, but perhaps I will revisit them again in the future. Also, this gives you some great ideas if you’d like to have me present at a club or event that you are organizing. When we drive a horse from a carriage we give up two thirds of the aids that are available to the rider. Without having the seat and leg available to communicate with the horse, the use of the bridle is more than critical, it’s our primary tool for communicating with the horse. With all the emphasis that is placed on handling the bit, becoming adept at handling the reins is crucial to successful driving. If you are limited to handling the reins with one in each hand, you are limited in the possibilities for communication with those reins. In this class we’ll cover the core reinsmanship positions that are best for handling the reins from a carriage. You’ll learn the fundamentals of the positions from riding, Coachman’s, Hungarian through to the Achenbach method. We’ll cover the advantages and disadvantages of each position, and when they will serve you best. This class, and the exercises that accompany it, will open new lines of communication with your horse and extend your range as a driver. Register now to improve your rein handling skills! All paid registrants will receive links to the downloadable materials, and a recording of the class for your review up to 90 days after the class is over. If you can’t attend the live session, you still get to see everything everyone else did! Developing positive muscle memory is the key element to making good driving automatic for you. The way to develop positive muscle memory is to teach your body the the coordinations you want to use before you have to use them. Once the coordination has been built, you can put it to use in your driving while paying attention to your drive, rather than the coordinated movements that make your drive. This class will build upon the skills and drills we worked on together in the first Better Reinsmanship Through Muscle Memory. We’re going to go over more specific techniques on how to keep the bit quiet while shortening the reins, how to create a great half-halt, and how to develop communications that your horse won’t miss. Don’t worry if you didn’t take the first one, you’ll still be able to keep up with this class. Bring your reins and whip, because this will be a hands on class where you’ll be practicing the skills and drills I’ve put together for you. There’s no better way to start getting ready for the driving season! This class will not be a simple overview of the CAA’s Driver Proficiency Program, but actual coaching that I share with students when they are having a lesson to prepare to take their level 1 evaluation. The information I will cover in this class will help you develop the knowledge and understanding of the subjects covered in a Level 1 DPP evaluation. 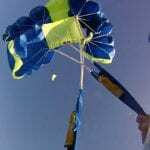 We will discuss harness types, their care, maintenance and fitting. Then you will learn about carriage balance, inspection and maintenance. Since the DPP program is not limited to subjects strictly adhering to carriage driving, but horse care and husbandry we will look into some of those subjects you’ll need to be well versed in earn your level 1 certificate. Of course, what would it all be without talking about actually putting a horse to the carriage and driving? We’ll go over do’s and don’ts when hitching, driving and returning with your horse. Does your horse stand patiently while you tack up, hitch or mount, have a conversation with a friend, or watch someone else ride? By stand patiently, I mean… stand. Not moving left or right, not calling to friends, but just standing still. If you ride or drive dressage tests, do you often get the comment “halt not immobile” or some derivative of that? Maybe at a pleasure show, your the one in the line up taking circles while the judge walks the line. If you’re dealing with these challenges, this class is going to be great for you! No matter what your choice of activities with your horse is, standing is probably the most universally important skills a horse can be taught. Yet, many people suffer from the idea that their horse isn’t patient enough or is too high strung to stand. The fact of the matter is, any horse can be taught to stand. 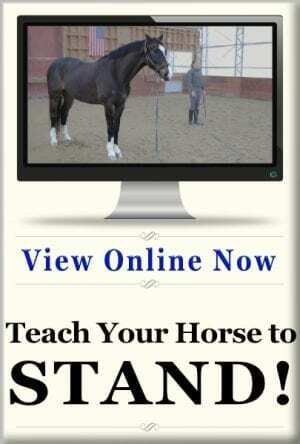 You must first understand and believe that, then you’ll be ready to teach your horse to stand. Once your horse learns this skill, teaching the horse every skill there after will become much easier. I see teaching a horse to stand as the most fundamental building block of a horse’s training, much like training a dog to sit before teaching it tricks. Teaching a horse to stand develops the horse’s submission and compliance, while allowing the equestrian to take their role as the leader in the relationship. Think about it, if you can get a great stand, then you can get a motionless halt. 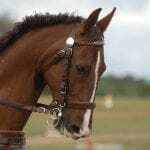 If you have a motionless halt, than you can have an organized halt to walk or trot transition. If your transition is more organized, it’s more balanced… I could go on. 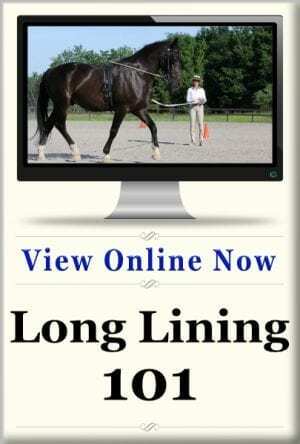 In this live, interactive online class, I will share with you my methodical approach to getting the horse to stand quietly, where ever, and when ever you decide. Since it is an interactive class, you’ll be able to ask all the questions you want during the class. You’ll come away from this class with a system that you can use to get your horse to stand “stock still”, without a hand on the horse. 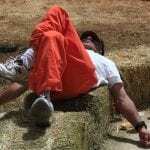 The great thing is, you can go out to the barn and put it to use the very next day! Communicating with your horse is what allows the horse to do the things that you want him to do. In broad terms you have three main tools to communicate with your horse, the reins, the voice and the whip. Unfortunately it’s the last one in that list that most drivers are not only ineffective with, many people just plain don’t understand. The whip is a critical communication device in your list of tools available when driving your horse. Of course not only is the tool only as good as it’s operator, it’s also only as useful as your horse’s understanding of the whip. You can use the whip in all of the right ways on your horse, and never have the message received. The horse has to be taught what the whip means to actually respond to it in positive ways. In this 90 minute class you learn how to define what the whip means for your horse beyond being a “motivational device”. 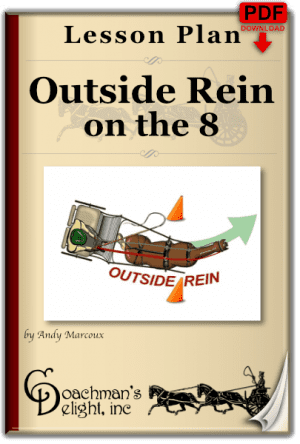 You’ll receive lesson plans for building the communication tools with your horse for understanding the whip from the ground, in harness and with the carriage. I’ll share tips on selecting, holding and handling the whip so those communications come through clearly. It may not always feel like it, but your horse is usually doing what you ask. The trouble lies in the fact that you may not always be asking your horse what you think you’re asking. When you do, you may unintentionally ask your horse for the same thing several different ways. One of the reasons this happens is do to inconsistent contact. As carriage drivers we depend primarily on the reins to communicate and receive most of the information that is exchanged between horse and driver. So it should be no surprise that managing your contact while driving a horse is critical to clear communication. Beyond understanding contact as a concept of how much weight should be applied to the reins, there are many other factors that effect the quality of your contact. Your body or hand position and even the direction in which you pull the reins are just a few of the variables that will have significant impact on the quality of your contact. In the online class “Understanding Contact” we’ll explore all of the variables that go into what creates clear contact that communicates your intentions to your horse. The marathon phase is undoubtedly the most fun part of a combined driving event. Of course, it isn’t just about driving hell bent for leather through hazards. There are arrows, compulsory turn flags and section times to contend with while you’re zooming along. No worries, just have your navigator take care of that, right? Your horse did come with a navigator/groom/personal attendant didn’t he? If he didn’t, you’d better do some studying to figure out all of the things that you’re going to ask your navigator (when you find one) to keep track of. If you’re going to be a navigator, you better learn your job, or your driver won’t feed you at the end of the marathon. Marathon Timing and Navigation is about the navigational part of navigating on a marathon. It’s not the fun galloping, wheel spinning, tail over the head, hard turning and fast breaking part that we love to talk about. It’s all that drivel in between… that can get us eliminated like a quiet little terminal condition. We’ll go over what all of those flags that make a nice piece of real estate look like a mine field. I’ll give you a great set of tools for working out your section times, and some suggestions on how to keep track of it all. There are certainly a lot of moving parts when we combine a horse, harness and carriage. Keeping an eye on all of those parts can seem to be an overwhelming task. Of course, ignoring the wrong thing can lead to a cascading effect of harness and carriage failures that can de-rail a fun weekend of driving, or worse yet create an accident. 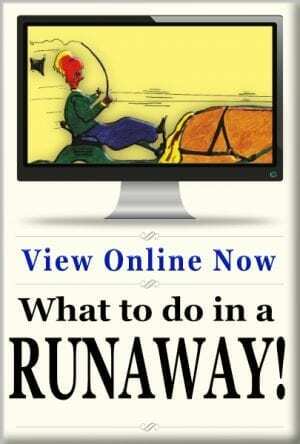 Knowing what to look for on the harness and the carriage can save you a world of grief. 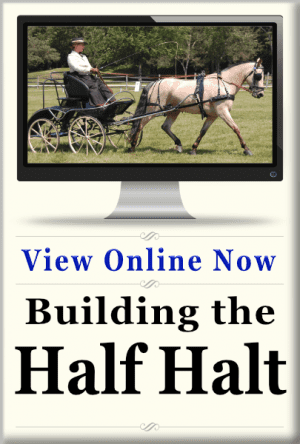 In this 90 minute, live, interactive online training, you’ll learn the critical areas of your harness and carriage that need specific attention from one drive to the next. You’ll learn the function of many of the carriage and harness parts that allow these systems to work together. We’ll cover what you should check on each and every drive, what to keep an eye out for from one cleaning to the next, and a few major maintenance items you should take care of once or twice a year. I can’t tell you how many people tell me “My horse loves cones!” Well, that’s probably true but for different reasons than you might think! Sure, your horse gets what the cones course is all about. It’s laid out there before your horse pretty clearly; “Go over here, go between these cones.” It sets out a pretty clear goal and makes sense why your driving where your driving. But the other reason your horse loves cones so much is that you probably drive much better when your driving cones than you do when the goals aren’t so well laid out for you! Driving cones exercises can be very instructive on how best to communicate your goals to your horse. 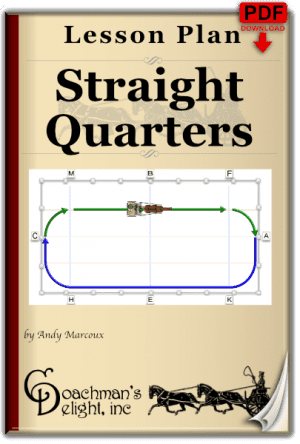 When there are specific, measurable marks for you to make, you naturally choose better lines and (usually) more realistic speeds all leading to better balance for your horse. This is also one the best places to learn about things like the outside rein, pace modulation, and flow. So, in fact, when you are out there having fun driving, you are actually improving your driving!